The aim of the present study was to investigate the clinical outcomes of two different standardized endodontic irrigation protocols. It was assumed that the additional use of ethylenediaminetetraacetate (EDTA) and passive ultrasonic irrigation (PUI) would result in an increased rate of absence of symptoms and remission based on the periapical index (PAI) compared to passive irrigation using only sodium hypochlorite (NaOCl). Data and radiographs from 199 teeth retrieved from the institutional endodontic database were analyzed retrospectively. In 106 teeth irrigation was performed using only NaOCl (protocol 1). Ninety-three teeth were irrigated using NaOCl and EDTA (protocol 2). Chlorhexidine (CHX) was additionally used in revision treatments in both groups. All irrigants in group 2 were activated by PUI. Mean follow-up periods were: protocol 1 = 9.2 ± 4.4 and protocol 2 = 6.6 ± 2.5 months (p < 0.0001 (chi-square test). The frequencies of the PAImasterpoint and PAIfollow-up scores did not differ significantly between teeth, which received either protocol 1 or 2 (p = 0.555 and 0.138). Statistical analysis revealed no significant association between treatment success (absence of clinical symptoms and PAIfollow-up = I or PAImasterpoint > PAIfollow-up > I) and the applied protocol (success rates: protocol 1 = 72.6% vs. protocol 2 = 82.8%; p = 0.203). Furthermore, the frequency of extractions did not differ significantly between the two protocols (p = 0.102). No association was found between follow-up time and treatment success (p = 0.888). The hypothesis was not confirmed. Even though the obtained success rate was higher after supplementing the irrigation protocol with EDTA and PUI, no significance was recorded. Hence, protocol 2 was not superior to protocol 1 regarding therapy success, at least within the limited follow-up period. It may be cautiously concluded that sufficient mechanical debridement combined with passive NaOCl irrigation results in comparably high success rates compared to EDTA and PUI. Keywords: Disinfection, Endodontic therapy, Passive ultrasonic irrigation, Root canal. Endodontic therapy aims at the elimination of all pathogens from the root canal system and dentinal tubules . Disinfection is thereby performed using sodium hypochlorite (NaOCl) and chlorhexidine (CHX) as standard of care . However, potential problems arise with complex root canal anatomies, dentinal tubule sclerosis, and the formation of a smear layer [3, 4]. Furthermore, microbial resistance poses a threat to treatment success, specifically regarding Enterococcus faecalis and Candida species [5, 6]. In order to enhance the antimicrobial efficacy of endodontic disinfection, different protocols have been established. Using the example of NaOCl, improved bactericidity, penetration, and tissue dissolving ability were reported from ultrasonic activation . Furthermore, ultrasonically activated ethylenediaminetetraacetate (EDTA) was introduced to remove the smear layer to facilitate the penetration of irrigants [8, 9]. To avoid undesirable effects like straightening of the root canal, passive ultrasonic irrigation (PUI) is currently preferred to active sonication . However, the superiority of ultrasonic irrigation over passive irrigation remains controversial [7, 8]. Furthermore, most studies investigating the effects of different irrigation protocols have been performed in vitro. Thus, the impact on relevant clinical outcome parameters remains partially unknown. In general, treatment success is heterogeneously defined based on clinical, radiological, and histological findings . Even though the presence of symptoms, e.g. fistulae or complaints, is considered to be treatment failure, the absence of these findings cannot necessarily be interpreted as success [12, 13]. Histological criteria of success have been defined as a physiological reconstitution of the periapical tissues including the absence of inflammatory cells . Nevertheless, histology is not routinely available. Thus, both clinical and radiological findings are most commonly used to assess the outcome of endodontic treatment. Accordingly, the German Society of Dentistry (Deutsche Gesellschaft für Zahn-, Mund- und Kieferheilkunde e.V. [DGZMK]) and the European Society of Endontology (ESE) suggest classifying the outcome as complete remission (absence of symptoms and radiological findings), incomplete remission (absence of symptoms and partial remission of the periapical lesion), or no remission (presence of symptoms and/or absence of radiological remission). The aim of the present study was to investigate the clinical outcomes of two different standardized irrigation protocols. Data obtained from the institutional endodontic database and radiographs of patients who received either NaOCl (and NaCl followed by CHX in revision cases) (protocol 1) or NaOCl + PUI followed by EDTA + PUI (and NaCl + PUI followed by CHX + PUI in revision cases) (protocol 2) were retrospectively analyzed. It was hypothesized that the absence of symptoms and periapical remission based on the radiographically assessed periapical index (PAI)  would significantly more frequently be detected among teeth which received protocol 2. The institutional endodontic database collects pseudonymized data of patients who received endodontic therapy including follow-up within the student’s educational program. It was established in November 2011 and assesses data to this day. Data were exclusively collected at the Department of Operative and Preventive Dentistry, Charité - Universitätsmedizin Berlin within the regular treatment and diagnostic protocols. The assessed data contained epidemiologic (age, gender, tooth) and clinical variables (anamnesis, symptoms, sensibility and percussion testing, probing depth, mobility grade). Furthermore, the endodontic database included data retrieved from standardized periapical radiographs recorded at the time of masterpoint try-in and recall visits. All radiographs were recorded using a digital sensor (XIOS Plus, Sirona, Wals bei Salzburg, Austria). Analysis was performed using radiographic software (Sidexis XG 2.61, Sirona, Wals bei Salzburg, Austria) and the same monitor (L246WHX, LG Electronics, Ratingen, Germany), which was set to a maximum resolution of 1.920 x 1.200 pixels. All radiographs were examined by two different physicians (E.K. and S.P.) who were highly experienced in endodontics. Both were blinded regarding the time of the radiography and the treatment protocol. Evaluation of the radiographs was performed by assigning PAI scores I–V . If the same PAI scores were obtained for the masterpoint try-in and the last recall visit (if PAI > 1), the investigators compared both radiographs and classified the size of the lesion at the time of follow-up as “decreased, constant, or increased.” The accordance between both observers was subsequently calculated. Following initial diagnostics, mechanical endodontic therapy was performed and accompanied by standardized irrigation protocols (Fig. 1). Depending on the root canal anatomy, treatment was performed either manually (Hedström files & K-Reamers, VDW, München, Germany) or utilizing rotating instruments (FlexMaster, VDW, München, Germany), applying a crown-down technique. Mechanical debridement procedures were unchanged within the investigated period. Irrigation protocol 1 was applied between November 1, 2001, and February 28, 2013. All teeth were passively irrigated using 1.0% NaOCl at all steps of treatment. Finally, 2.0 ml of NaOCl were applied for 30 seconds per canal. In revision cases, all canals were additionally irrigated with 2.0 ml of 0.9% NaCl followed by 2.0 ml 2.0% CHX for 30 seconds per canal. Irrigation protocol 2 was established to replace protocol 1 after an interim period of one month on April 1, 2013. Teeth of patients treated until April 30, 2014, were considered for inclusion. All applied irrigants were activated using PUI. The protocol was performed using 1.0% NaOCl + PUI at all steps of therapy. Final irrigation consisted of 2.0 ml of NaOCl + PUI for 30 seconds followed by 2.0 ml 20.0% EDTA + PUI for 30 seconds per canal (and 2.0 ml 0.9% NaCl + PUI followed by 2.0 ml 2.0% CHX + PUI for 30 seconds per canal in revision cases). PUI was performed utilizing an ISO 15-finger spreader (VDW, München, Germany) and a 28 kHz ultrasonic device (VDW Ultra, VDW, München, Germany) at 20% power/irrigation activation mode. Regardless of the applied irrigation protocol, all canals were filled using gutta-percha and a sealant (AH Plus, Dentsply, Mannheim, Germany) applying a lateral condensation technique (Fig. 1). Irrigation protocols and number of teeth (= number of patients) treated accordingly. Data from all teeth treated according to protocol 1 or 2, which were contained in the institutional endodontic database, were eligible for the analysis if the last follow-up radiography was taken at least three months after completing endodontic treatment. Therapy outcomes were evaluated based on clinical and radiological findings and classified according to the guidelines of the DGZMK and the ESE as follows: (i) complete remission: absence of clinical and radiographical symptoms (physiological dimension of the periodontal space in terms of PAIfollow-up = I); (ii) incomplete remission: absence of clinical symptoms and subtotal remission of the periapical lesion (PAImasterpoint > PAIfollow-up > I); and (iii) no remission: presence of clinical symptoms and/or absence of decrease in size of the periapical lesion (PAImasterpoint ≤ PAIfollow-up > I). Additionally, it was evaluated if extraction was necessary. The outcomes (i) and (ii) were classified as treatment success, whereas (iii) and extraction were defined as therapy failure. Statistical analyses were performed using Pearson’s chi-square test, one-way analysis of variance (ANOVA) and a binary logistic regression model (SPSS Statistics 23, IBM, Armonk, NY, USA). The level of significance was defined as p ≤ 0.05. The article does not contain any clinical studies including humans or animals performed by any of the authors. All procedures retrospectively assessing data from humans were in accordance with the ethical standards of the institutional and national research committee and with the 1964 Helsinki declaration and its later amendments. Formal approval was granted by the institutional ethical review committee of the Charité - Universitätsmedizin Berlin (EA1/327/13). One hundred and ninety-nine out of 250 teeth treated between November 1, 2001, and February 28, 2013, and between April 1, 2013, and April 30, 2014, met the inclusion criteria and were included in the analysis. The included 199 teeth belonged to 199 different patients (95 females and 104 males). One hundred and six teeth were treated according to protocol 1, whereas protocol 2 was applied in 96 teeth (Fig. 1). No significant differences in the distribution of gender, age, localization (maxilla vs. mandible), tooth (anterior teeth vs. premolars vs. molars), and type of therapy (initial treatment vs. revision) were detected between the patients and teeth treated with either protocol 1 or 2 (p > 0.05 (chi-square test)) Table 1. The mean age and standard deviation of the included females and males were 56 ± 16 (range: 19-93) years and 58 ± 14 (range: 23-82) years, respectively. Age distribution did not differ significantly between genders (p = 0.280 (chi-square test)). Epidemiologic, clinical and therapeutic parameters of the included teeth (n = 199). Percentages are given among the respective treatment protocol. Mean follow-up periods and standard deviations (range) were 9.2 ± 4.4 (range: 3.0-24.0) months and 6.6 ± 2.5 (range: 3.0-14.0) months for the teeth treated with protocols 1 and 2, respectively. The underlying differences were statistically significant (p < 0.0001 (chi-square test)). The frequencies of the PAImasterpoint and PAIfollow-up scores did not differ significantly between the teeth, which received irrigation protocol 1 or 2 (p = 0.555 and 0.183 (chi-square test)). Overall, treatment success was 72.6% and 82.8% after using protocols 1 and 2, respectively. However, no significance was detected (p = 0.203 (chi-square test), 0.247 (ANOVA) and 0.243 (logistic regression analysis). Stratified for initial therapy (n = 154) and revision (n = 45), success was recorded in 68.9% and 82.7% and in 84.4% and 75.1% following protocols 1 and 2 (p = 0.073 and 0.627 (chi-square test), respectively. No significant association between the applied protocol and therapy success was detected performing a stratified analysis regarding anterior teeth, premolars, and molars (p = 0.845 (chi-square test)). Furthermore, no significant association between follow-up time and success was found (p = 0.888). Three teeth treated with protocol 1 had to be extracted for showing clinical symptoms (exacerbation, complaints, and mobility grade III) and progressive periapical lesions. No extractions were performed following protocol 2, at least within the examined period. However, the frequency of extractions did not differ significantly between protocols 1 and 2 (p = 0.102 (chi-square test)) (Table 2). Outcome parameters of the included teeth (n = 199). Percentages are given among the treatment protocols. Both investigators assigned equal PAI scores, with the exception of 23 out of 398 radiographs. Thus, the resulting baseline accordance was 94.2%, which was widely equivalent to previously reported results obtained from highly specialized investigators [16, 17]. The referring radiographs were revised and discussed by both observers, resulting in 100% accordance. Due to equal PAI scores at the time of masterpoint try-in and follow-up, the change in dimension of the periapical lesion was separately assessed among 49 teeth (protocol 1: 26 and protocol 2: 23) if PAI was > 1. Baseline accordance was 87.8% (6 mismatches out of 49 radiographs). The referring radiographs were again revised, resulting in 100% accordance. Furthermore, statistical analysis was separately repeated for the baseline PAI score and change of lesion dimensions series of both investigators. Equivalent results were obtained in terms of an absence of a significant association between the applied protocol and treatment success (p > 0.05 (chi-square test, ANOVA, logistic regression analysis)). The aim of the present study was to investigate if applying an irrigation protocol supplemented with EDTA and PUI (protocol 2) would result in an increased success rate compared to passive irrigation using only NaOCl (protocol 1). Within the present approach, this was not confirmed based on the presented definition of success (absence of clinical symptoms and PAIfollow-up = I or PAImasterpoint > PAIfollow-up > I). 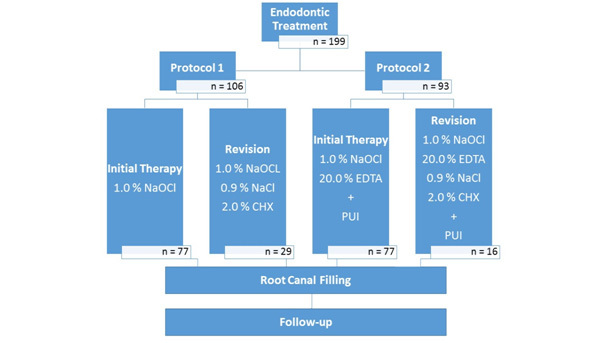 Even though higher success rates were found overall for endodontic treatments as well as initial therapies after applying protocol 2, the underlying differences were not statistically significant. Thus, applying a lavish disinfection protocol was not beneficial to the success rate within the present study. Ultrasonic activation has been described to enhance irrigant delivery and agitation by the physical phenomena of stream and cavitation. In vitro, canal cleanliness, irrigant transfer to the canal system, soft tissue debridement, and removal of smear layer and biofilms can be improved . The additional use of EDTA has been related to further enhancement of smear layer removal . Nevertheless, the referring studies widely lack standardization of the applied methods, thereby diminishing comparability . Furthermore, both transferability to in vivo and the impact of these findings on relevant clinical outcome parameters remain partially uncertain. As a consequence, the use of ultrasounds in endodontics is controversial [7, 8]. Based on the obtained results, it may be assumed that ultrasonic activation of irrigants (PUI) and removal of the smear layer using EDTA might be of limited benefit or even lack enhancement of the success rate. Despite the bactericidal efficacy of PUI, disinfection was reported to be incomplete . Thus, the persistence of bacteria poses a threat to treatment success due to recurrent infection. Complete remission of radiological findings has been described to take up to four to five years. Furthermore, the absence of radiological findings does not necessarily correspond to complete histological remission . As a consequence, histological findings would have to be included into the assessment of treatment success, which of course is impossible. Hence, the results retrieved in the present study may be regarded as well transferable to clinical routine. However, it has to be emphasized that the follow-up periods of the teeth treated according to protocol 1 were significantly longer compared to those that received protocol 2. This was evidently due to the fact that protocol 1 was used prior to protocol 2 in our department. Nevertheless, it has to be discussed whether applying protocol 2 might result in significantly higher success rates if similar follow-up periods would be compared. Against this, statistical analysis revealed that follow-up time was not significantly associated with treatment success. However, this may be considered in further investigations. As elaborate irrigation protocols are both costly and time-consuming, their efficacy has to be assessed critically. Nevertheless, the obtained results should be confirmed by prospective clinical trials. If the findings would be confirmed, costs, time, and materials might be saved in the future. Treatment success was not found to be significantly associated with one of the investigated irrigation protocols. Within the limitations of the present study, it may be cautiously concluded that sufficient mechanical debridement combined with meticulous passive NaOCl irrigation (supplemented with CHX in revision cases) provides success rates comparable to elaborate irrigation protocols including EDTA and PUI. These findings strongly encourage conducting prospective clinical trials to confirm the obtained results. Chavez de Paz LE. Redefining the persistent infection in root canals: possible role of biofilm communities. J Endod 2007; 33(6): 652-62. Vianna ME, Gomes BP. Efficacy of sodium hypochlorite combined with chlorhexidine against Enterococcus faecalis in vitro. Oral Surg Oral Med Oral Pathol Oral Radiol Endod 2009; 107(4): 585-9. Paqué F, Luder HU, Sener B, Zehnder M. Tubular sclerosis rather than the smear layer impedes dye penetration into the dentine of endodontically instrumented root canals. Int Endod J 2006; 39(1): 18-25. Lo Giudice G, Cutroneo G, Centofanti A, et al. Dentin morphology of root canal surface: A quantitative evaluation based on a scanning electronic microscopy study. Biomed Res Int 2015; 2015(4): 1-7. George S, Kishen A, Song KP. The role of environmental changes on monospecies biofilm formation on root canal wall by Enterococcus faecalis. J Endod 2005; 31(12): 867-72. Peciuliene V, Reynaud AH, Balciuniene I, Haapasalo M. Isolation of yeasts and enteric bacteria in root-filled teeth with chronic apical periodontitis. Int Endod J 2001; 34(6): 429-34. Mohammadi Z, Shalavi S, Giardino L, Palazzi F, Asgary S. Impact of ultrasonic activation on the effectiveness of sodium hypochlorite: A review. Iran Endod J 2015; 10(4): 216-20. Schmidt TF, Teixeira CS, Felippe MC, Felippe WT, Pashley DH, Bortoluzzi EA. Effect of ultrasonic activation of irrigants on smear layer removal. J Endod 2015; 41(8): 1359-63. Sousa SM, Silva TL. Demineralization effect of EDTA, EGTA, CDTA and citric acid on root dentin: a comparative study. Braz Oral Res 2005; 19(3): 188-92.
 van der Sluis LW, Gambarini G, Wu MK, Wesselink PR. The influence of volume, type of irrigant and flushing method on removing artificially placed dentine debris from the apical root canal during passive ultrasonic irrigation. Int Endod J 2006; 39(6): 472-6. Hamood E. The evaluation of success and failure of endodontic treatments. J Aust Soc Endod 2001; 27(2): 80-4. Bender IB, Seltzer S, Soltanoff W. Endodontic success-a reappraisal of criteria. 1. Oral Surg Oral Med Oral Pathol 1966; 22(6): 780-9. Bender IB, Seltzer S, Soltanoff W. Endodontic success-a reappraisal of criteria. II. Oral Surg Oral Med Oral Pathol 1966; 22(6): 790-802. Abbott PV. Recognition and prevention of failures in clinical dentistry. Endodontics. Ann R Australas Coll Dent Surg 1991; 11: 150-66. Orstavik D, Kerekes K, Eriksen HM. The periapical index: a scoring system for radiographic assessment of apical periodontitis. Endod Dent Traumatol 1986; 2(1): 20-34. McCaul LK, McHugh S, Saunders WP. The influence of specialty training and experience on decision making in endodontic diagnosis and treatment planning. Int Endod J 2001; 34(8): 594-606. Molven O, Halse A, Fristad I. Long-term reliability and observer comparisons in the radiographic diagnosis of periapical disease. Int Endod J 2002; 35(2): 142-7. Mozo S, Llena C, Forner L. Review of ultrasonic irrigation in endodontics: increasing action of irrigating solutions. Med Oral Patol Oral Circ Bucal 2012; 17(3): e512-6. Goel S, Tewari S. Smear layer removal with passive ultrasonic irrigation and the NaviTip FX: a scanning electron microscopic study. Oral Surg Oral Med Oral Pathol Oral Radiol Endod 2009; 108(3): 465-70. Jensen SA, Walker TL, Hutter JW, Nicoll BK. Comparison of the cleaning efficacy of passive sonic activation and passive ultrasonic activation after hand instrumentation in molar root canals. J Endod 1999; 25(11): 735-8. Barthel CR, Zimmer S, Trope M. Relationship of radiologic and histologic signs of inflammation in human root-filled teeth. J Endod 2004; 30(2): 75-9.